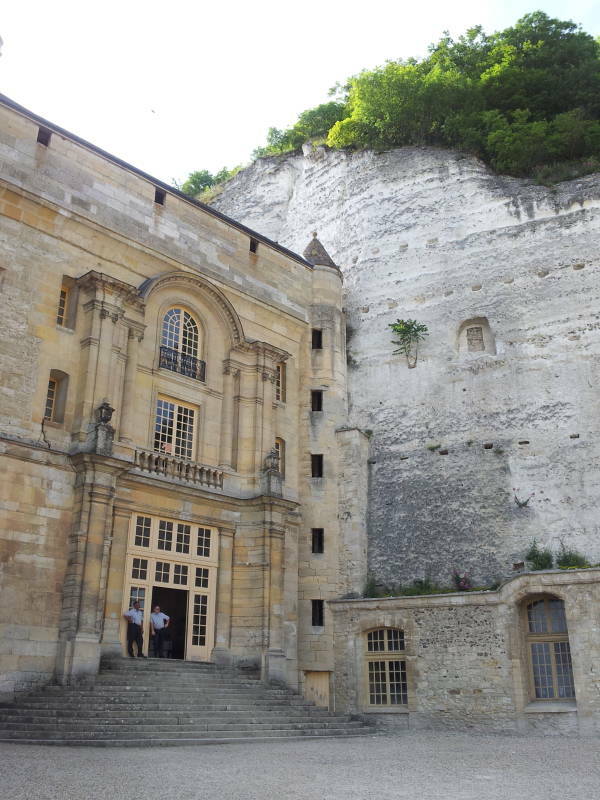 La Roche-Guyon is in a narrow area between the Seine river and the base of the bluffs leading up to the Vexin plateau. The geology includes a layer of white Campanian chalk about 80 million years old and 80 metres thick, topped by a layer of Montien limestone about 65 million years old. Limestone is soft, but it protects the even softer chalk below it. Erosion cuts the layers into steep cliffs, undercut in places. People have then dug homes and storage facilities into the chalk layer over the millennia, as at Haute-Isle. The area has been inhabited since the Paleolithic era. A Gallo-Roman villa is thought to have been here in the 3rd to 4th centuries AD, but no traces remain. A small Merovingian cemetery indicates that there was a small community here during the High Middle Ages. The Treaty of Saint-Clair-sur-Epte in 911 defined the site as a strategic location on the frontier of France, facing Normandy or the Norman territory controlled out of Rouen. That was the treaty ceding control of Rouen, the lower Seine, and the coastal region to the Norse leader Hrólfr, known to Latin chroniclers as Rollo. 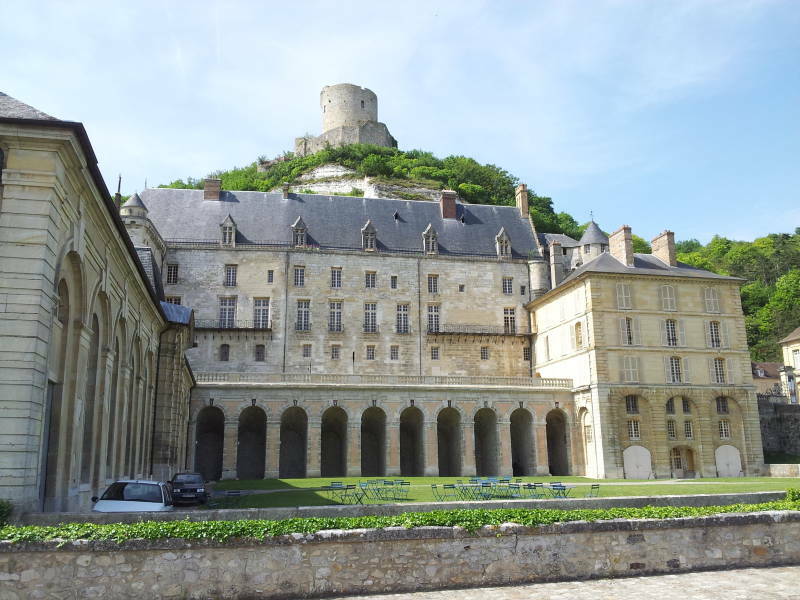 The first castle built here and based on top of excavated tunnels was built in 1066, the year of the Norman Conquest of England, as defense for the French royal territory of the Île-de-France. Au sommet d'un promontoire abrupt, dominant la rive du grand fleuve de Seine, se dresse un château affreux et sans noblesse appelé La Roche. Invisible à sa surface, il se trouve creusé dans une haute roche. L'habile main du constructeur a ménagé sur le penchant de la montagne, en taillant dans la roche, une ample demeure pourvue d'ouvertures rares et misérables. 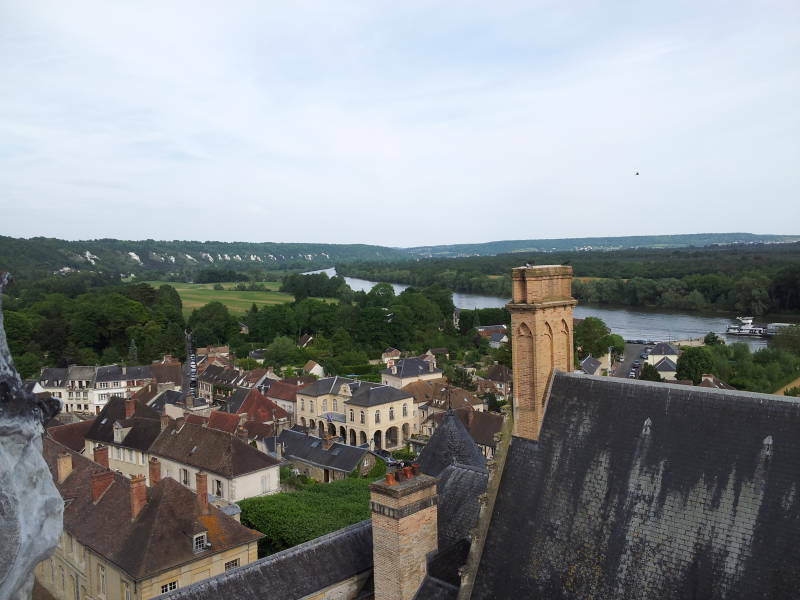 At the summit of a steep promontory, dominating the bank of the great river Seine, rises a frightful castle without title to nobility, called La Roche. Invisible on the surface, it is hollowed out of a high cliff. The able hand of the builder has established in the mountainside, digging into the rock, an ample dwelling provided with a few miserable openings. Around 1190, they built a tower at the top of the bluff. 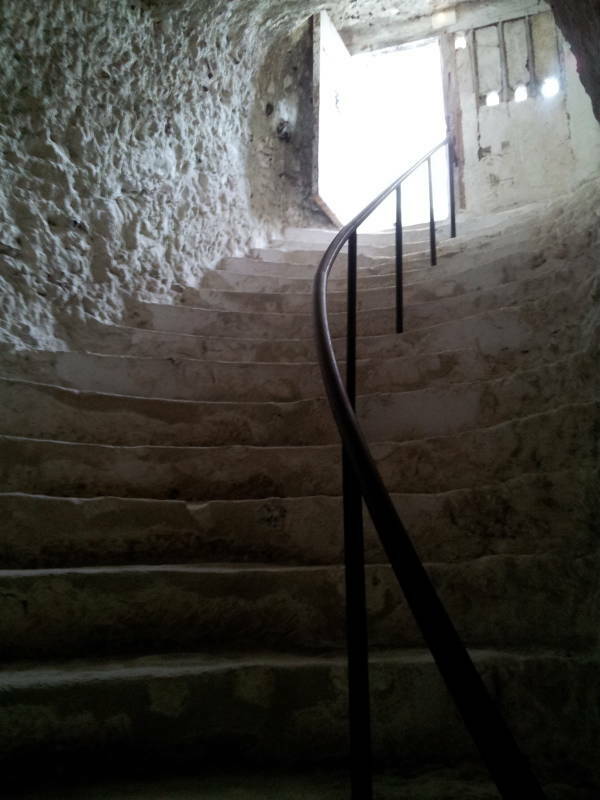 A tunnel containing a 100-step staircase runs up through the bluff, connecting the rock-carved fortress to the tower. The château-bas or lower castle, a fortified manor house, began construction in the mid 13th century. It was built directly out of the face of the bluff, concealing the original fortress. That was greatly expanded during the 18th century. 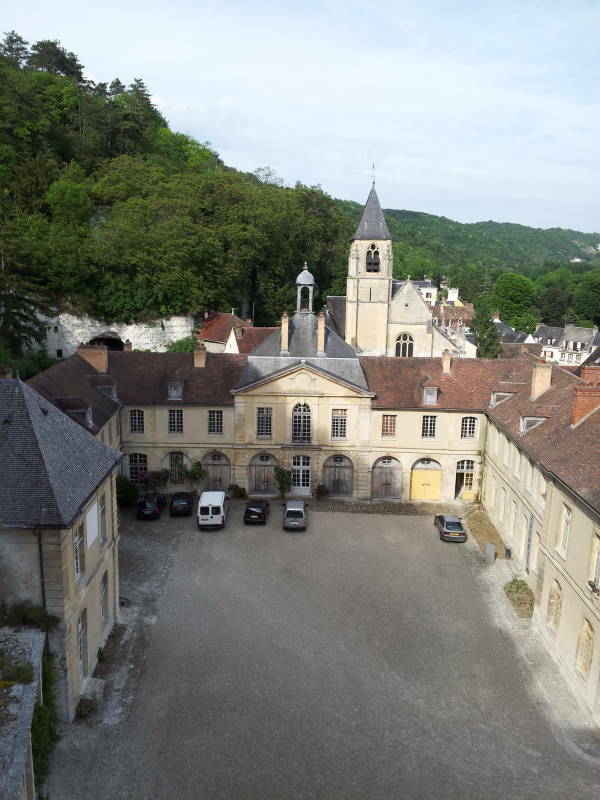 The Guy La Roche family were the lords of the fief through the 10th to 15th century. 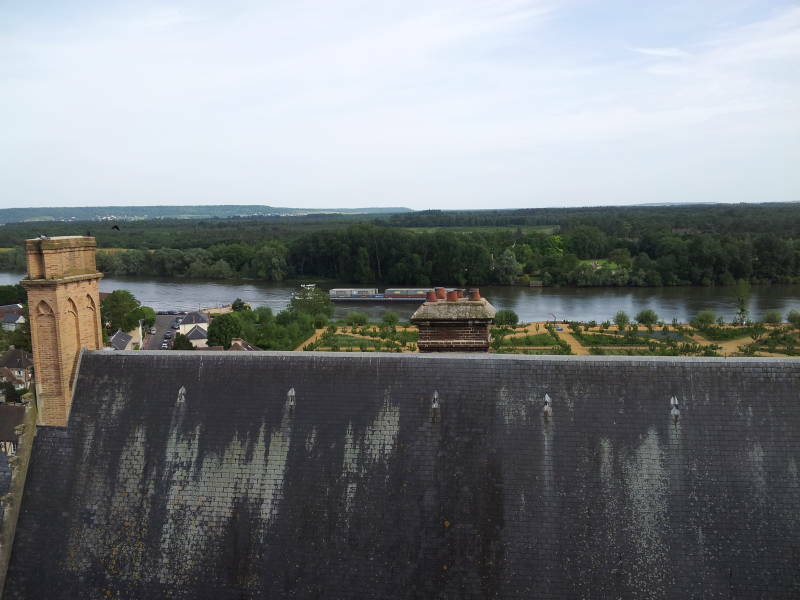 During the Hundred Years' War, Guy VI de La Roche was close to the Dauphin, was given control of the tolls on the Seine, and was close to Charles V and Charles VI of France. Charles V died in his arms, so yeah, he was pretty close. But then Guy VI was killed at the Battle of Agincourt on 25 October 1415. His widow took control, and then the English besieged the castle for six months. Henry V of England was then based at Mantes, and his forces eventually took control of the castle. 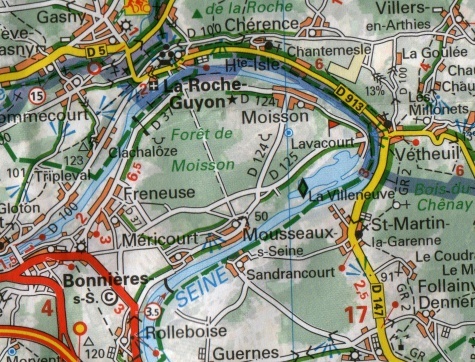 The land within the loop across the Seine was part of the Duchy of La Roche-Guyon. 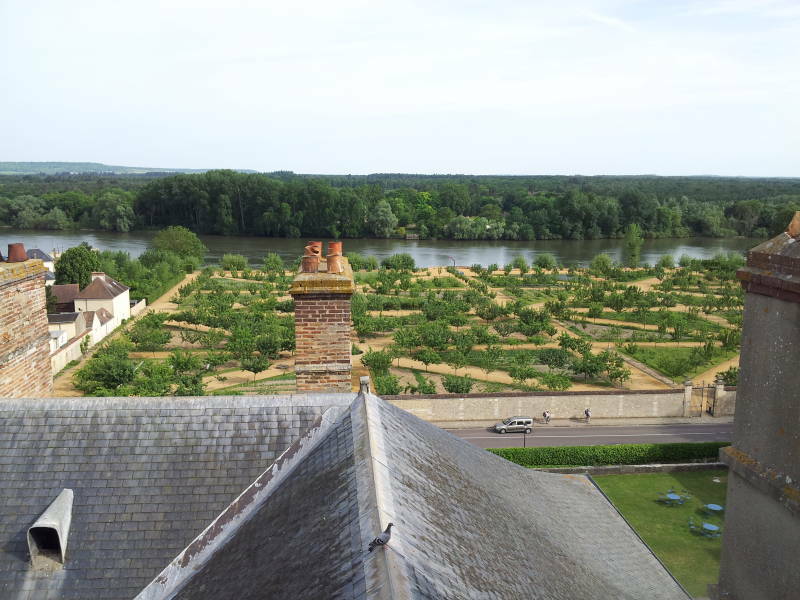 Various large-scale rabbit-raising, forestry, and even silkworm operations were undertaken there by the various Dukes of La Rochefoucauld, the Lords of La Roche-Guyon, who took control of La Roche-Guyon in 1659. Bridges were built across the river. The first was built in 1840 and operated until 1914. Then there was a cable-drawn ferry through 1934. A large single-arch reinforced concrete bridge opened in 1935. It was the largest of that design in Europe at the time. On 9 June 1940 the French military engineers used 400 kilograms of explosives to render the bridge unusable. It was never repaired. It appeared on maps until the 1950s but eventually its remains were demolished and removed. The Germany Army installed an anti-aircraft post at the castle on 17 March 1943. Then Field Marshal Erwin Rommel arrived at his new headquarters here in February 1944. Rommel had been appointed commander of the newly created Deutsches Afrika Korps in February 1941. He was promoted to the rank of Generalleutnant and flew to Tripoli on 12 February. He became known as the "Desert Fox" to the British and American forces in North Africa. His last offensive in North Africa was in March 1943, after which he handed over command and flew back to Germany. Rommel was moved to Greece in July 1943 as commander of Army Group E to counter a possible British invasion, but he was recalled to Berlin on the day he arrived in Greece due to the fall of Mussolini. He was then briefly posted to Italy. On 21 November 1943 Hitler moved Rommel and Army Group B to Normandy with responsibility for defending the French coast against the anticipated Allied invasion. The German High Command was divided as to how to best meet the expected Allied invasion. Gerd von Rundstedt, the Commander-in-Chief West, felt that Allied naval firepower made it impossible to stop the invasion near the beaches. German armor should be held in reserve as far inland as Paris, letting the allied to extend their forces deep into France before counter-attacking. Rommel saw that this approach worked on the Eastern Front, where air superiority was important but not absolutely so. But his experiences late in the North African campaign had shown him that Allied air power would eliminate much of the German armor. He believed that the only opportunity would be to oppose the landings at the beaches, and to counter-attack there. He said, "It is absolutely necessary that we push the British and Americans back from the beaches. Afterwards it will be too late; the first 24 hours of the invasion will be decisive." The Atlantikwall, the defensive measures along the Atlantic coast of France, Belgium, Netherlands, and Denmark, were little more than a token effort. Rundstedt had confided to Rommel that the current Atlantic Wall was a sham useful for propaganda purposes only. Rommel arrived at La Roche-Guyon in February 1944. He visited the Normandy beaches and was greatly disappointed by the poor state of affairs and minimal improvements being made. He directed an enormous acceleration of building, laying millions of mines, almost six million in northern France, and thousands of obstacles on the beaches and throughout the countryside. In April 1944 Rommel promised Hitler that the Atlantic Wall through Normandy and on toward Calais, where the Germans expected the landings to occur, would be completed by May. But over a month later, at the OPERATION OVERLORD landings of 6 June 1944, the defenses were impressive but still far from complete. Many of the German troops were of poor quality, many bunkers were incompletely stocked with ammunition, and many obstacles and gun emplacements were not completed. Rommel had gone on leave to Ulm, near Bavaria, on the 4th. He rushed back to La Roche-Guyon when he learned of the Normandy landings. Rommel had supported the rise of Adolf Hitler and the Nazi seizure of power. However, scholars continue to debate Rommel's attitude toward Nazi ideology and the degree to which he knew about and was involved in the Nazi regime's crimes. Some say that no swastikas were displayed in the village of La Roche-Guyon during the time that Rommel's headquarters was there. Three of Rommel's friends — Stuttgart Oberbürgermeister Karl Strölin, General Alexander von Falkenhausen, and General Carl-Heinrich von Stülpnagel — were members of the a plot to assassinate Hitler. Rommel is said to have concluded at least by the start of 1944 that Germany had lost the war. The three had talked Rommel into joining the plot by the first of February 1944, according to Strölin. 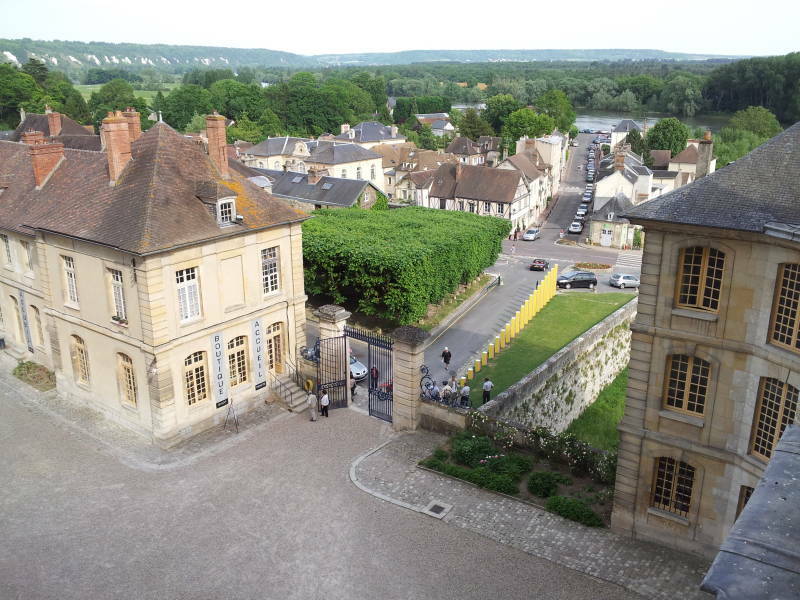 Supposedly the anti-Hitler group had held secret meetings at Rommel's headquarters in the Château Roche-Guyon, out of the Gestapo's observation. Rommel had opposed assassinating Hitler, at least initially. After the war, his widow and others said that Rommel had believed that an assassination would lead to civil war in Germany and Austria and the elevation of Hitler to the position of a martyr for a lasting pro-Nazi cause. Rommel is said to have instead favored arresting Hitler and bringing him to trial for his crimes. Hitler visited military headquarters in Margival, near Soissons in Picardy in northern France, on 17 June 1944. Rommel did not attempt to capture Hitler then, but the plan would have been unlikely to succeed given Hitler's extremely tight personal security. As Rommel had commanded Hitler's military protection detail in 1939, he would have known about the level of security. 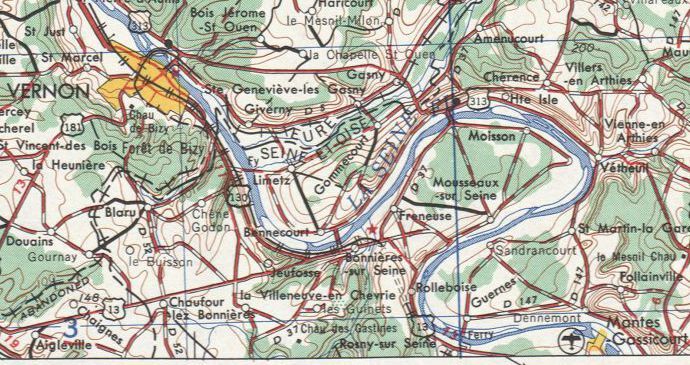 There are claims that Rommel tried to get Hitler to visit his headquarters in La Roche-Guyon in order to capture him there. On 17 July 1944, Rommel was returning to La Roche-Guyon from a visit to the front. An RCAF Spitfire of 412 Squadron strafed his staff car near Sainte-Foy-de-Montgommery. A 20 mm round shattered the driver's left arm after he had accelerated to get off the main roadway. The staff car left the road and crashed into some trees. Rommel was thrown from the car and suffered three skull fractures and facial lacerations. Rommel was in a coma for five days, and then transferred to his family's home in Ulm, Germany. Marshal Günther von Kluge took over Rommel's command at La Roche-Guyon. There had been at least four attempts during 1943 and early 1944 to get one of the military conspirators close enough to Hitler to kill him with hand grenades, bombs, or a pistol. Hitler no longer appeared in public and only rarely visited Berlin, spending most of his time at the Wolfsschanze, his headquarters the "Wolf's Lair" in East Prussia near Rastenburg. He was always heavily guarded and seldom met with people he did not know or trust. On 20 July 1944, Claus von Stauffenberg bought a bomb in a briefcase into the conference room at Rastenburg. He left the room, and someone unintentionally moved the briefcase so the blast from the bomb was largely deflected by the heavy leg of the conference table. Three officers and a stenographer were killed. The high-ranking officers in the plot widely believed that Hitler was dead. General Carl-Heinrich von Stülpnagel, by then the military governor of occupied France, disarmed the SS and its SD branch and captured most of their leadership. He traveled to La Roche-Guyon and told Günther von Kluge to contact the Allies, only to be told that Hitler had survived. The assassination and accompanying military coup d'etat had failed. At least 7,000 people were arrested by the Gestapo, and 4,980 of them were executed. Allied Intelligence had been investigating how they might assassinate Rommel since March 1943. After D-Day, with the fierce resistance organized by Rommel under Hitler's orders to defend German positions at all costs, British Field Marshal Montgomery agreed on a plan to assassinate Rommel. To kill ROMMEL would obviously be easier than to kidnap him and it is preferable to ensure the former rather than to attempt and fail in the latter. Kidnapping would require successful two-way W/T communication and therefore a larger party, while killing could be reported by pigeon. Lee and his team parachuted into Orléans on 25 July 1944. Three days later they learned about Rommel's severe injuries. The team moved toward the advancing U.S. Army lines on foot, ambushing trains and attacking German units from the rear as they went. They met up with U.S. forces on 12 August. 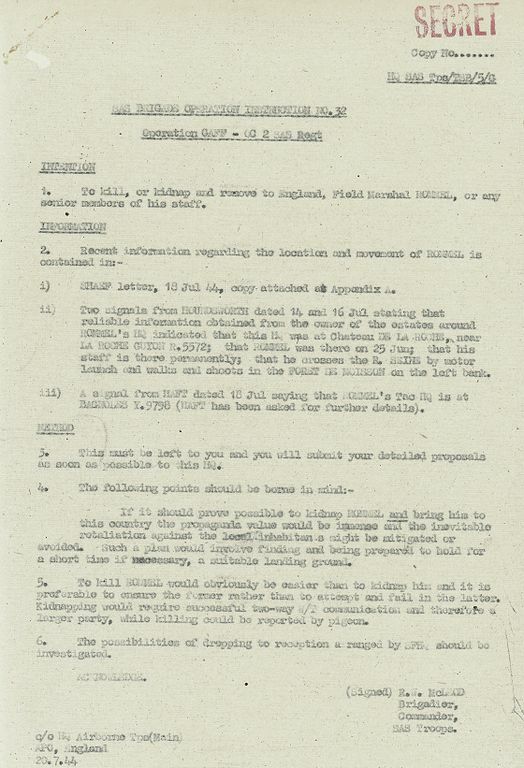 Operational order for Operation GAFF, 20 July 1944. Post-operational report, Captain S. W. Lee, page 1. Post-operational report, Captain S. W. Lee, page 2. Tues 25 Jul Sucessful landing - good DZ, but three leg bags smashed (string broken) - cannot find container. Wed 26 Jul Contacted locals - extremely helpful. Spent most of the day looking for container. Cannot find it. Three young Frenchmen want to come with us. I engaged them and for the rest of the op - they'll be extremely good and useful for going for information wherever I want to send them, to get us food and especially to recce on bicycle during daylight the roads that I shall be taking the next evening. Thurs 27 Jul Journey to plateau - spent the night in a farm. Fri 28 Jul Journey to ST REMY de CHEVREUX. Stayed for two days in a chateau - ate plastic and was extremely sick for two days: cured myself with six gallons of milk - learned that Rommel had been got. Sat 29 Jul Journey to a farm near MAUREPAS. Sun 30 Jul Journey to BEYNES - went to a safe farm on the ST CYR ROUGE (my base since). Mon 31 Jul Journey to ROSAY. Tues 1 Aug Journey to MERICOURT. We live in the woods and I start getting information on my target. I learn that they have been bombed two days before and that everybody but a few soldiers have left for another HQ - I cannot find where. I stayed for two days in the area and I am glad that I do not have to attack this place. I can see that it was very well protected. Then I decide to go back to BEYNE, make my base there and start working as well as I can. Sat 12 Aug Extremely successful week. We walk at night from our base, go to our target on well known roads (my three young Frenchmen are extremely useful all the time) and come back next morning unseen. We got two trains - 9F6705408 with blowing the line under it with a pull switch and a long string. Due to its lack to speed could not derail it but it had to stop and was set on fire at dawn by Lightnings. The other, 9F4682568, was got single handed with 2 mags of Bren gun in the engine by 1.Cl. MOORE. The train stopped and again was set on fire next morning by fighters. 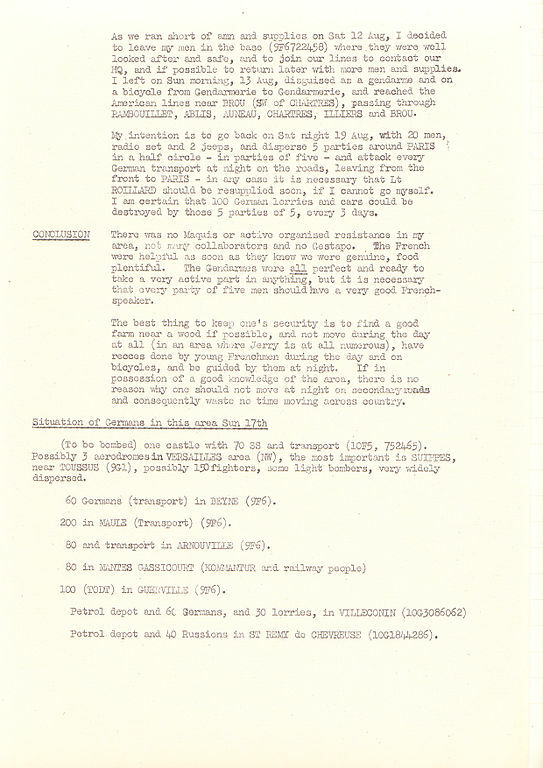 3 lorries from a convoy in 9F6687555, 4 lorries on different small roads, 1 staff car driven by a Gestapo major (got his papers) in 9G2709305, 1 staff car (9F6578531) with 1 motor-cyclist in front, 1 driver, 1 body guard and 1 hight ranking German officer, certainly a colonel possibly a minor general. We could not get to him because as we fired on the car, German lorries came down the road, stopped and took defensive positions. I attacked the Kommandantur at MONTS to try to get the car, but the alarm was given and I failed. 4 jerries were killed by us, but as my Sgt MARK talked to the sentry in German they thought they had been attacked by Germans, and started shooting each other in the dark. I was told next day that 12 corpses were found (?). 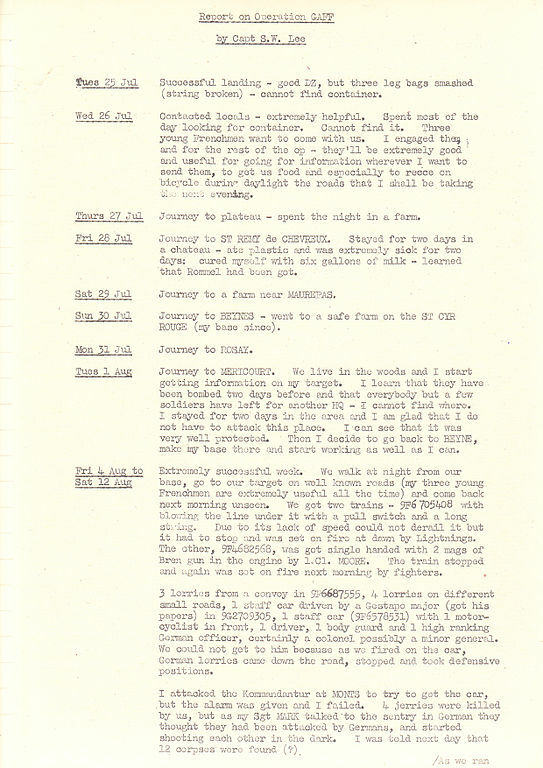 As we ran short of amn and supplies in Sat 12 Aug, I decided to leave my men in the base (9F6722458) where they were well looked after and safe, and to join our lines to contact our HQ, and if possible to return later with more men and supplies. I left on Sun morning, 13 Aug, disguised as a gendarme and on a bicycle from Gendarmerie to Gendarmerie, and reached the American lines near BROU (SW of CHARTRES), passing through RAMBOUILLET, ABLIS, AUNEAU, CHARTRES, ILLIERS and BROU. My intention is to go back on Sat night 19 Aug, with 20 men, radio set and 2 jeeps, and disperse 5 parties around PARIS in a half circle - in parties of five - and attack every German transport at night on the roads, learning from the front to PARIS - in any case it is necessary that Lt ROILLARD should be resupplied soon, if I cannot go myself. I am certain that 100 German lorries and cars could be destroyed by these 5 parties of 5, every 3 days. CONCLUSION There was no Maquis or active organised resistance in my area, no many collaborators and no Gestapo. The French were helpful as soon as they knew we were genuine, food plentiful. The Gendarmes were all perfect and ready to take a very active part in anything, but it is necessary that every party of five men should have a very good French-speaker. The best thing to keep one's security is to find a good farm near a wood if possible, and not move during the day at all (in an area where Jerry is at all numerous), have recces done by young Frenchmen during the day and on bicycles, and be guided by them at night. If in possession of a good knowledge of the area, there is no reason why one should not move at night on secondary roads and consequently waste no time moving across country. (To be bombed) one castle with 70 SS and transport (10F5, 752465). Possibly 3 aerodromes in VERSAILLES area (NW), the most important is SUIPPES, near TOUSSUS (9G1), possibly 150 fighters, some light bombers, very widely disperses. 60 Germans (transport) in BEYNE (9F6). 200 in MAULE (Transport) (9F6). 80 and transport in ARNOUVILLE (9F6). 100 (TODT) in GUERVILLE (9F6). Petrol depot and 40 Russians in ST REMY de CHEVREUSE (10G1844286). Lee was born Raymond Couraud. He joined the French Foreign Legion at 18, falsifying his age as 22. Soon after training he took part in the Battles for Narvik. He returned to France and joined retreating French forces near Marseille in July 1940. He was captured, imprisoned, and then acquitted in December 1940 and released by the Vichy government. He became a smuggler of illegal goods and people. He met three American women in Marseille — a socialite, an art student, and a journalist. The three formed a volunteer group that, with Couraud's help, smuggled over 2,000 refugees out of occupied France, crossing the Pyrenees into Spain, or on board freighters to North Africa and the Americas. The people they saved included Otto Meyerhof, the 1922 winner of the Nobel Prize in Medicine; the writer and philosopher Hannah Arendt, who coined the phrase "the banality of evil" in her reporting on the 1961 trial of Adolf Eichmann; and the artist Marc Chagall. Couraud crossed the Pyrenees into Spain in April 1941 on his way to the British Consulate in Barcelona, but he was arrested at the Madrid railway station and interned for four months. When he finally arrived in England in October 1941, he joined the Free French Forces. He was assigned to the Special Operations Executive, and commissioned as 2nd Lieutenant Jack William Raymond Lee. Name changes were common in the French Foreign Legion and other irregular forces during the war. Couraud, now Lee, took part in the 28 March 1942 raid on Saint Nazaire, a beach raid near Cannes in August 1942, and an operation near Narbonne in November 1942. In the last one he was forced to kill three Vichy policemen, and he escaped through Barcelona and Lisbon to return to England. He was transferred in January 1943 from S.O.E. into the 62nd Commando, which became the 2nd regiment of the Special Air Service. In March 1943, 50 French soldiers were taken out of 2 SAS to form the 2 SAS French 2nd Squadron, commanded by now Captain Lee. After Operation GAFF, Lee became second in command of 2 SAS. He left the British Army in December 1944, returned to France, and became part of the French Army General Staff. The German Army evacuated La Roche-Guyon on 18 August 1944. The Allies didn't realize this, and a bomb raid on the evening of 25 August 1944 dropped sixty-four bombs on the village and eight on the castle. Meanwhile, many of the 20 July plotters were arrested. Before long, Rommel was under suspicion. Stülpnagel had failed in a suicide attempt, became delirious, and kept muttering "Rommel". Another plotter had named Rommel after being tortured. A third had included Rommel on his list of potential post-coup Reich Presidents. On 27 September, Martin Bormann gave Hitler a memorandum stating that several known plotters had testified that Rommel was fully informed of the plot and promised to support the replacement government. Gestapo agents were sent to place Rommel under surveillance. Two generals from Hitler's headquarters went to Rommel's home on 14 October 1944. They informed him of the charges and offered him a choice. He could face the People's Court, leading to a certain death sentence for him, his staff, and his family. Or he could commit suicide, he would be buried as a hero, and his family would receive a full pension. As they were talking this over, an SS detachment surrounded the house. Rommel explained things to his wife and son, dressed in his Afrika Korps jacket, and left with the generals. They drove out of the village, stopped the car, and left him with a cyanide capsule. The government announced that Rommel had died of a cerebral embolism caused by the skull fractures. Rommel was given a state funeral. Rommel had insisted that the funeral be held in Ulm, not Berlin, and it was. Rommel had also insisted that there be no political paraphernalia displayed, but the Nazis had decorated his coffin with swastikas. Repairs and restoration work were done from 1946 through 1959. In 1987 the ducal family auctioned off the remaining furniture, fixtures, and the library. Since 1994 the château has been open to the public. Some tapestries and furniture and art objects have been replaced. Starting in 2010, a rotating exhibition of contemporary art works has been installed. About 460 people now live in the town. 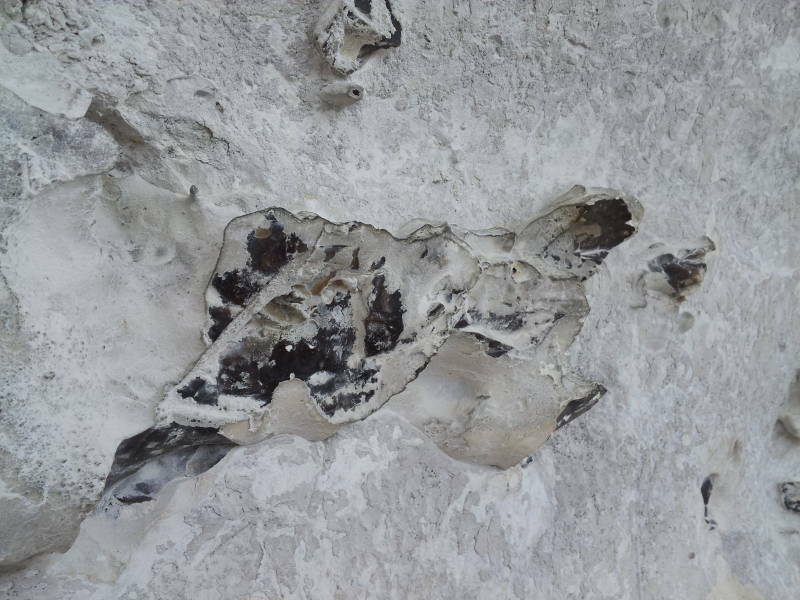 The chalk has numerous flint inclusions. Chalk is a form of limestone, calcium carbonate or CaCO3. It forms under deep marine conditions as minute calcite shells accumulate. It has reasonably high resistance to weathering, and can form tall steep cliffs. Flint is a hard sedimentary form of quartz or SiO2, occurring mostly as nodules within sedimentary rocks such as chalk and limestone. It can be worked into flakes and blades, and was used by the local people to make tools during the Paleolithic. 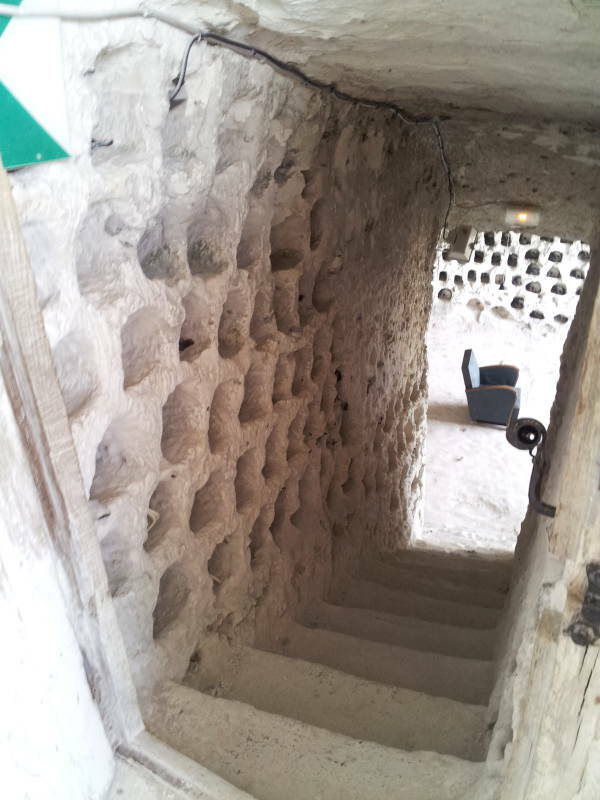 Some of the interior spaces carved out within the bluff face have had numerous dovecotes added. This is very similar to what I've seen in Cappadocia in central Turkey. 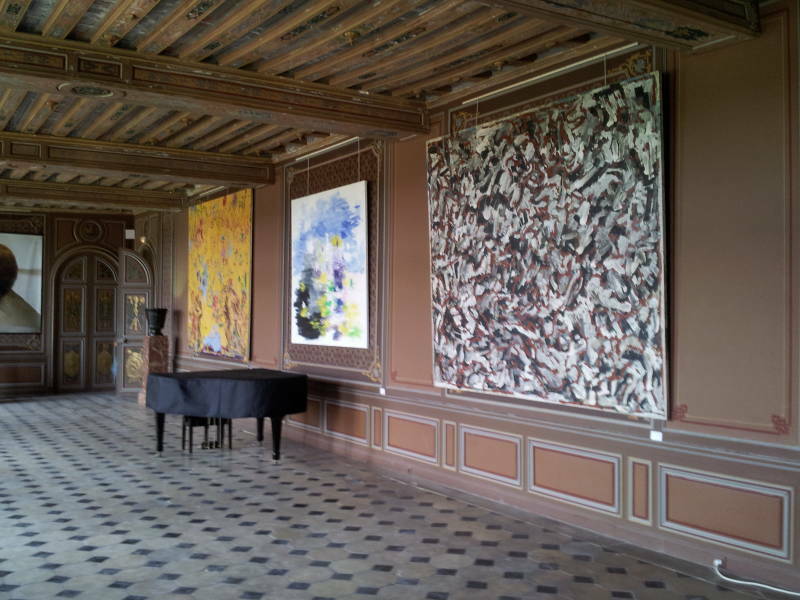 Make sure to stop and see Claude Monet's home and the gardens where he made so many paintings. Over a half-million people visit Giverny each year, it's the second most visited site in Normandy after Mont-Saint-Michel. The town itself is small. Its population was about 300 when Monet moved there in 1883 and it has only grown to about 500 today. I have been there, but it was on a trip in the paranoid autumn of 2001 when I still had just a film camera. I have pictures, but they don't do justice to Giverny. The house is pink with bright green shutters and trim. Pink and bright green. That sounds garish, but it looks nice. The fully saturated colors continue inside, with bright yellow walls and furniture in the dining room, bright blue tiles in the kitchen, and over 200 Japanese prints throughout the house. Who am I to question Claude Monet's color choices? Monet was traveling through here on a train in 1883 when he noticed Givery and immediately decided to move there. He rented the house and surrounding land, until 1890 when he had enough money to buy it. Once he owned the property, he began building the gardens. In 1893 he diverted a branch of the Epte river to form the famous water lily ponds. He lived here until his death in 1926. 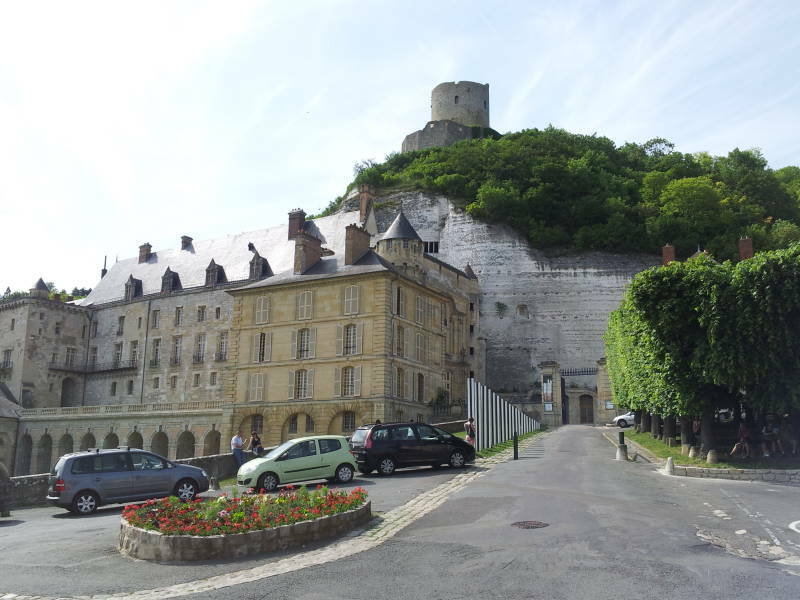 Now we'll continue north along the Seine to Château Gaillard, built by Richard Lionheart during the Hundred Years' War.